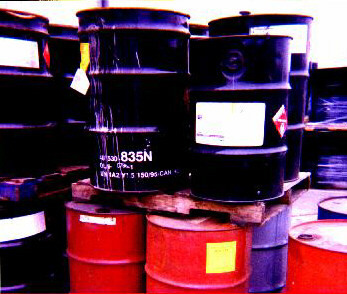 In general, you are not permitted to treat your hazardous wastes on site without first obtaining a RCRA permit. However, there are exceptions to this general rule. This column discusses three specific cases where you can treat hazardous waste without a RCRA permit and/or dispose of it through your wastewater treatment plant. Spent solvents containing any of the following carcinogens: carbon tetrachloride, benzene, tetrachloroethylene, and trichloroethylene. The limits for these spent solvents are 1 ppm. Spent solvents containing the following non-carcinogens: methylene chloride, 1,1,1-trichloroethane, chlorobenzene, o-dichlorobenzene, cresols, cresylic acid, nitrobenzene, toluene, methyl ethyl ketone, carbon disulfide, isobutanol, pyridine, spent chlorofluorocarbon solvents. The limits for these solvents are 25 ppm. In order to calculate the concentration limit, you can do it two ways. One way is to have a laboratory test the concentration in your wastewater. The easiest way however is to look at your maximum total weekly usage of these solvents and divide that amount by the average weekly flow of wastewater that you passed through your wastewater treatment plant. For example, let’s say you use 800 kg of methylene chloride each week for solvent purposes and the average amount of wastewater treated at your plant is about 5 million gallons a day. So that is 35 million gallons for 7 days. There are 2.2 pounds in a kilogram and assuming each gallon weighs 8 pounds, this works out to be about 127 million kilograms per week of wastewater. So when you divide 800 into 127 million, you get 6.3 parts per million (ppm) as the concentration of you spent solvent in your wastewater stream. Since methylene chloride is not a carcinogen, the maximum limit for the de minimis exemption is 25 ppm. Your discharge of 800 kg of that particular spent solvent into your wastewater treatment plant clearly falls in within the limits and is therefore exempt from hazardous waste regulations. Conversely you can also calculate the maximum amount of spent solvents [methylene chloride] that can be discharged in a week under the de minimis exemption. In this case, the maximum amount of methylene chloride that can be discharged through your wastewater treatment plant over a week is 3175 kilograms. Along the same line, there is also a de minimis exemption for losses of commercial chemical products. This applies to very small amounts of commercial products that are inadvertently lost during normal material handling operations. Many of these lost materials end up being listed hazardous waste when they are discarded. Many of these materials are typically disposed of at the plant level by washing them onto floor drains that lead to a wastewater treatment plant. As with the previous exemption, the de minimis losses of commercial products must be directed to a permitted wastewater treatment plant under the Clean Water Act. Any large international losses of these wastes would not be considered as de minimus and will not be exempted under the de minimis losses exemption. The same applies to losses which result from mismanagement, neglectfulness or carelessness during normal operating procedures. The third exemption is the elementary neutralization unit. Under 40 CFR 260.10, you are allowed to neutralize waste streams that have been classified as hazardous solely because they are corrosive. In other words, this exemption does not apply to corrosive waste streams that also contain other hazardous waste characteristics such as ignitability, reactivity or toxicity. You can neutralize the waste in a tank, tank system, container, transport vehicle or vessel as defined in 40 CFR 261.10. For example, if you have an acidic waste and an alkaline waste, you can mix the two streams in a container or tank and neutralize them. If you have just one corrosive waste stream, you can neutralize it with the appropriate acid or base. This type of “treatment” is exempt from federal RCRA regulations. All of these exemptions fall under federal regulations. You should always check with your state agency. Individual states may have more stringent requirements. For example, California places severe restrictions on the volume of wastes you can neutralize on-site. We have seminars designed for California regulations.